There is a recurring theme I notice in life. It’s that we are not mindful as we go through our days. Once, while leading one of my yoga classes, we were doing Moon Salutations for the New Moon. I like to mix things up after a few rounds, and sometimes each round for both focus and mindfulness. This particular class had three individuals who have done this flow with me many times. What occurred, was all three of them anticipated a pose I included in the last round, and none of them heard me lead them into a different pose at that point. All three of them are in Crescent Moon pose, and I’m in Warrior II pose. I joked that their Warriors all needed some work…and all three of them looked at me at the same time. They realized what they had done. They weren’t paying attention and being in the moment. This was an “Aha” moment. This is just one incident, but many occur to each of us on a daily basis. 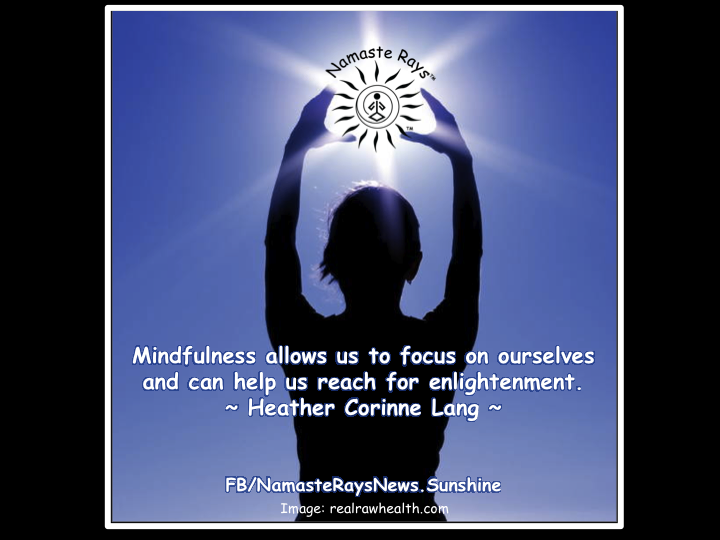 Mindfulness allows us to focus on ourselves and can help us reach for enlightenment. Mindfulness is being in your present moment without anticipating what is coming next. It’s allowing what comes next to flow to you. So many people tend to go through the motions without being attentive to the situation. Driving is a perfect example. While driving, many are paying more attention to distractions such as the radio, the cell phone, other car occupants, or thinking about their “to-do” list. Yet, driving requires mindfulness. If you aren’t paying attention to driving, you might hit another car, or you might run a stop sign, or worse, hurt yourself or someone else. Another example is when we are rushing through a chore or are running late, and we aren’t paying attention to what we are doing, and we either fall down, run into something or harm ourselves in some other way. It’s important to slow down, breathe and be very aware of what you are doing to avoid causing harm, but also to learn something new. Mindfulness is many things, as well. It’s being attentive to each moment, action, feeling and thought. It’s ensuring you know exactly what is happening around you and within you, without judging or comparing. It’s being completely aware and focused in the present moment without worrying about the future or repeating your past. Mindfulness is not allowing yourself to be distracted by outside forces, people, events or situations. Mindfulness allows you to focus solely on you and the purpose at hand. Mindfulness can then lead to enlightenment as you recognize what is happening within you. You can then be aware of a feeling that crops up repeatedly or a situation and you can attend to it. I’ve recently recognized through a healing session I had with my healing friends that I have hips which are rounded in. I’ve been to chiropractors and not one ever mentioned this to me. Perhaps I wasn’t ready for that message yet. But, the hips have been causing my lower back tightness, and this area, front & back, is the sacral chakra. The message for me was very profound physically, mentally, emotionally and spiritually. I learned something that I didn’t realize I was still carrying around for the past two decades or so…from previous lifetimes! Being mindful of my hips, and connecting this to the message has allowed me to release some cords for healing….mind, body & soul…very enlightening. May you practice mindfulness in your life and reach for your enlightened self! Wow…thank you so very much for reblogging so many of my posts! Very grateful!